Get the right amount of asphalt sealcoat every time with our handy blacktop calculator! Simply enter in how you plan to apply the sealer, as well as the number of square feet you will be sealing, and click Calculate! 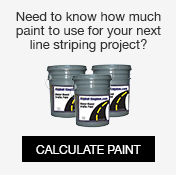 Our blacktop and sealcoat calculator is helpful for homeowners, contractors, and property owners because it lets you find out how much sealer you will need depending on your application method and your required coverage in square feet. Simply measure the width and length of your sealcoating area, and multiply it to find how many square feet you are sealing. If it’s a small driveway, then you can use a tape measure or measuring wheel. For larger parking lots, you will have to use a measuring wheel or a measuring device that you can drive around the property. If it’s a rectangular property with a rectangular building, you can measure the entire property and then deduct the size of the building. 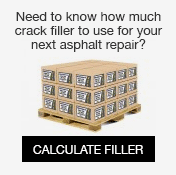 Once you find the square foot coverage you will need, our asphalt sealcoat calculator will let you know which size container you will need and how many of those containers you will need to complete the job. We offer our sealer in 5 gallon pails, 55 gallon drums, and 275 gallon totes. People with spray machines can dilute the sealer with up to 20-30% water, allowing for even more sealcoat coverage. People using brushes, rollers, or squeegees will not be able to dilute the sealer, but will be able to add sand for traction. If you are using a spray machine, it is more cost effective to purchase drums or totes than to buy several 5 gallon buckets at a time. You can look at all of the sealer pricing here or you can take a look at our sealer plant pickup program, where you can pick up sealer at any of the 9 plants we have in the United States. If you need to learn more about sealcoating, we have an online guide to sealcoating as well as helpful videos in our video center. 1-866-399-5562 for advice you can trust.